Jefferson Bass is the pseudonym for writing team Bill Bass and Jon Jefferson. Mr. Bass is a world-renowned forensic anthropologist and founder of the University of Tennessee’s Anthropology Research Facility, better known perhaps via Patricia Cornwell as the Body Farm. Mr. Jefferson is a veteran journalist, writer, and documentary filmmaker. His writings have been published in the New York Times, Newsweek, USA Today, and Popular Science. Along with Bass, he is co-author of Bass’s chilling and critically acclaimed memoir, Death’s Acre. As a team, they have collaborated in three nonfiction tomes, and six works of fiction. The Bone Yard is their seventh in the fiction category. The onset of summer brings predictably steamy weather to the Body Farm, Dr. Bill Brockton’s human-decomposition research facility at the University of Tennessee. But Brockton’s about to get more heat than he’s bargained for when Angie St. Claire, a forensic analyst with the Florida Department of Law Enforcement and former student, asks him to help prove that her sister Kate’s death was not suicide, but murder. If there’s one thing Angie St. Clair knows, it’s murder when she sees it. She also believes she knows the perpetrator. But knowing and proving can be worlds apart at the best of times, and never easy to team. To make matters more difficult, the local coroner, having ruled Kate’s death a suicide, has acceded to her husband’s demand to inter the body speedily. Why would the husband want to go to such drastic measures, especially for a loved one? Could he have something to do with Kate’s murder, or is he simply an innocent looking guilty? With his powerful connections, Brockton offers to help Angie determine the truth and get justice for her sister. Brockton’s quick consulting trip takes a long, harrowing detour when bones begin turning up amid the pines and live oaks of the Florida panhandle. Two adolescent skulls–ravaged by time and animals, but bearing the telltale signs of lethal fractures—send Brockton, Angie, and Special Agent Stu Vickery on a search for the long-lost victims. The quest leads them to the ruins of the North Florida Boys’ Reformatory, a notorious juvenile detention facility that met a fiery end more than forty years ago. Back in 1967, nine boys and a guard were killed when the building burned to the ground. But local lore has it that the school had a reputation for brutal disciplinary methods—its troubled students understood that one wrong move could get them an early grave. As Brockton and his team close in on the truth, they find skeletons in some surprisingly prominent closets, and they soon discover that the ghosts of the past pose perilous consequences in the present. It’s not too long before Brockton discovers there’s a terrible darkness in the Sunshine State. When reading The Bone Yard, you always have the feeling there is more truth than fiction being unearthed alongside the hidden bones and grisly modes of murder. 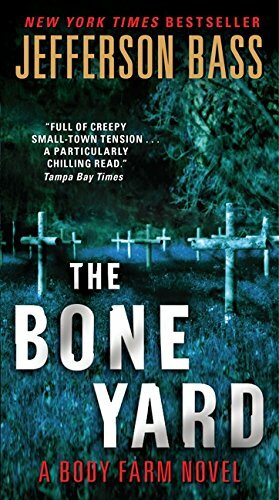 Fascinating in its description of forensic detail alongside evildoers and avenging angels, all fans of the multi-popular CSI families will love The Bone Yard. Jefferson Bass makes Patricia Cornwell and Kathy Reichs look like amateurs in the field. Make no bones about that. Sam Millar is a crime novelist and also the former owner of a chain of comic book stores, K.A.C. Comics, in New York City. He is the author of The Dark Place and On the Brinks.